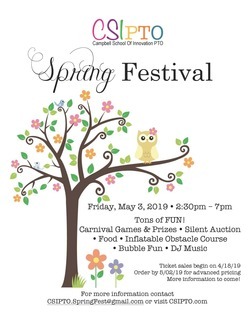 Volunteers are needed for CSI PTO's 1st ever Spring Festival! There will be games, food, silent & live auction, and much more. Please see the list below for volunteer opportunities that are available. Move Auction Items to designated location after the close of each closing phase. Posts winning bidder number, write Auction Receipts and files the receipts.